This tool allow to read/open the Clarion (.dat) and TopSpeed (.tps) data files on any computer. An application don't use any external libraries (no BDE, no ODBC, no ADO etc) and you may run this tool on computer without any additional setup/install. You may see the full Clarion system information (file version, header size etc), table structure and data in grid. 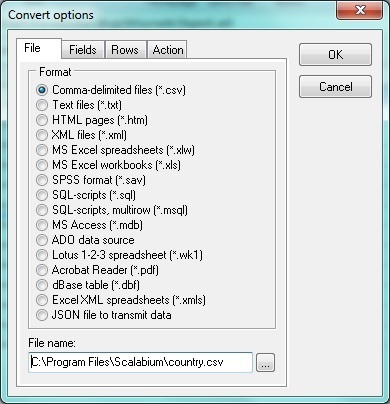 When Clarion file loaded, you may save the data to different file formats (CSV, Text, HTML, XML, MS Excel, MS Access, SPSS, SQL, dbf, JSON etc) or copy to clipboard. You may convert any Clarion data file into another file format without any programming in a few mouse clicks. All features are available via command-line arguments so you could automate any your tasks. * one license allow to work with this software on one computer only (one person). You need as many licenses as the computers wherein our product will be installed and/or used. Personal license: one license allows to install and use our product on one home computer (one person) only. You can use the product for non-commercial purposes in non-business, non-commercial environment. Business license: one license allows to install and use our product in a corporate, government or business environment on one computer. Site license: you can install and use our product on an unlimited number of computers in one domain. Please note that we can issue a single-user license to a person name only. If you wish your license to be issued to an organization name, you should buy either a multi-user license or several single-user licenses. ShareIt Buy It! Buy It! 2Checkout Buy it! Buy it! PayProGlobal Buy it! Buy it! Delivery is done by sending you a registration code (which turns the evaluation copy into the fully registered version) via email. If you can help us maintain the customer support in your native language, please drop us a line, and you'll get a free registration (personal license)! Only please contact us prior to starting the translation, you'll receive instructions how to do this.